The conventional form of pigeon racing is for each pigeon keeper to race birds to his or her own loft which may be on an allotment or more commonly in their own garden. The distance from the starting point to each individual loft is calculated to the nearest yard and the birds of each club or group of clubs are all released together with each bird carrying a secretly numbered rubber race ring or an electronic ring. When a bird arrives at its home loft either the rubber ring is removed and placed in a clock which registers the time or the electronic ring registers on a computer. Knowing the distance of the flight and the time taken enables the club to work out the average speed and the bird with the highest average speed is declared the winner. 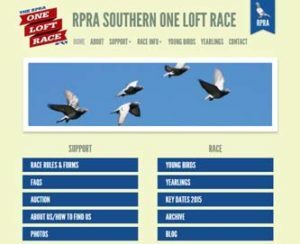 One Loft Racing is a modern form of pigeon racing which has become popular since the start of the 21st century and with the invention of electronic timing systems. To hold a successful One Loft Race it is essential that all the pigeons are taken to the special loft to be used for the event at about 6 weeks of age which is before they are able to fly. Once they go outside the loft and begin to fly they grow to accept it as their home. Our loft at Birtsmorton near Tewkesbury is around 60 yards long and currently houses over 1600 pigeons. The pigeons are cared for by a full time loft manager Jeremy Davies and two part time staff, one of which is his partner Julie. On receiving the young pigeons, from all parts of the country in March and April, their first task is to check that the birds are in good health, after which they are vaccinated against paramyxovirus, given an electronic ring and entered on the computer. The next few weeks are important because the birds are getting used to their new environment and learning to return to the loft when called in by the loft manager. As time goes by they spend longer and longer exercising around the loft and by the end of June they are ready for training to start. The start of the training period is a busy time for the loft manager because each time the birds are taken for a flight he has to transfer them from the loft into crates, each of which holds about 30 pigeons. The pigeons quickly learn to walk into the crates which when full are placed on the special trailer ready to be taken to the release point. The early training sessions are from about 5 and 10 miles to get the birds used to the trailer and into the habit of returning straight back and into the loft when called. Later training flights take place from increasing distances up to 50 miles which will normally take the birds a little over an hour to complete. The actual racing consists of a series of ‘hot spot’ races which steadily increase in distance before eventually culminating in a final race of around 200 miles distance. On these occasions, prior to being placed in the crates, each pigeon’s electronic ring is scanned by a reader attached to the computer and this signifies that the bird has been entered in the race. The trailer complete with its crates is then towed to the release site where the birds are given time to settle and have a drink of water. Once the loft manager is satisfied that the weather conditions are suitable (good visibility and some blue sky) the birds are released all together to make their way home. The first bird to pass over the electronic sensors at the entrance to the loft is the winner. Prizes are given in each of the races with the biggest being awarded in the longest race. This final event attracts many visitors to the loft to witness the arrival of the birds and to see who will receive the first prize of £25,000 plus the many smaller awards and special prizes for schools. See our separate RPRA One Loft website for the very latest news and information.